To write the review, I borrowed a copy from my local public library. Few people are aware that in 1944, Gonzalo Mendez sued the Westminster School District in California when they wouldn't allow his children, Sylvia and Gonzalo, Jr. to attend the local public school. The principal stated, Rules are rules. The Mendez children have to go to the Mexican school. Sylvia, who spoke perfect English and was born in the United States, wondered if the reason was, because we have brown skin and thick black hair and our last name is Mendez? It was. 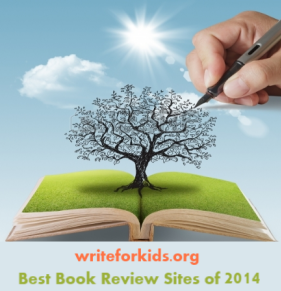 This exceptional informational picture book is a moving tribute to the Gonzalo family. Readers are taken through the events that finally lead to the decision that paved the way for the desegregation of all schools in the United States with the 1954 Supreme Court ruling Brown vs. Board of Education. It took three years, from 1944 until April 15, 1947 when the San Francisco Court of Appeals ruled in favor of the Mendez family. That June, Governor Earl Warren signed the law that all children in California were allowed to go to school together, regardless of race, ethnicity, or language. Duncan Tonatiuh' is a Mexican author/illustrator. His book Diego Rivera: his world and ours won the 2012 Pura Belpre illustration award. In Separate is Never Equal, Tonatiuh's art incorporates hand-drawn collage and digitally colored illustrations resembling a traditional folk art style. Young Sylvia, in her long braids, is present in every two-page spread. Tonatiuh did extensive research for this book. The dialogue in the trial scene and throughout the story comes directly from court transcripts and from conversations with Sylvia Mendez. Back matter includes an author's note, glossary, bibliography and index. 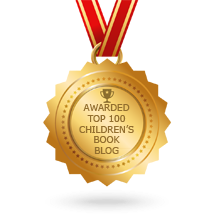 All children need to be aware of the steps taken in history to fight for social justice. Separate is Never Equal goes hand-in-hand with Freedom Summer by Susan Goldman Rubin and other books on discrimination and the Civil Rights Movement. Another great book about changes for girls: Let me play : the story of Title IX : the law that changed the future of girls in America by Karen Blumenthal. 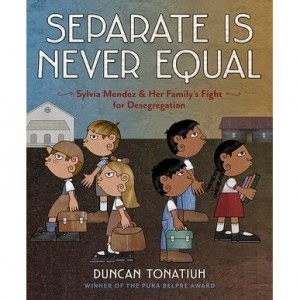 Read Elizabeth Bird's review of Separate is Never Equal on her Fuse8 blog. Learn more about Duncan Tonatiuh. An interview with Tonatuih on YouTube.